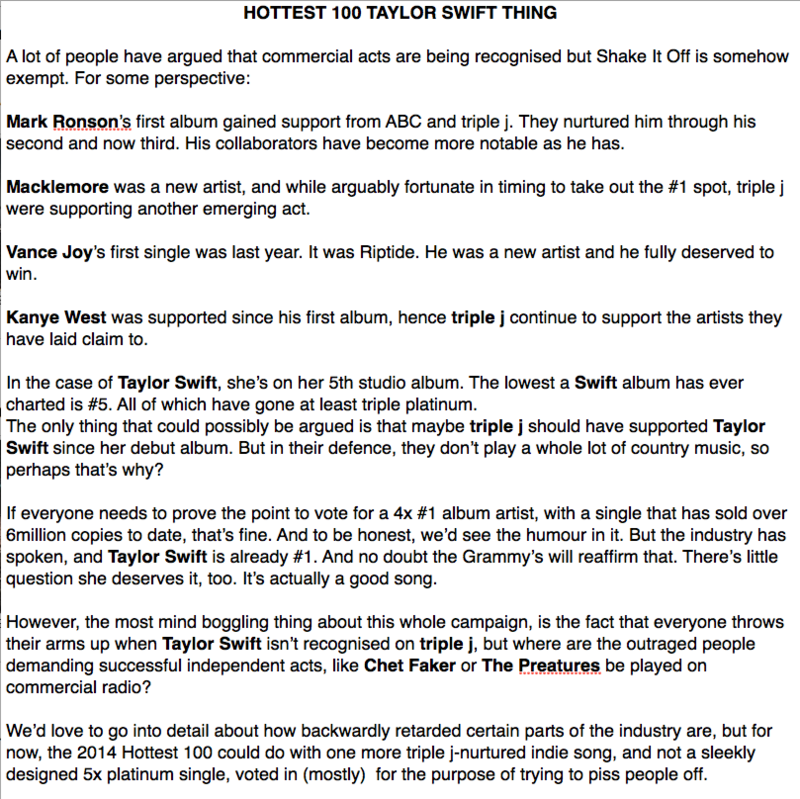 #Tay4Hottest100 may have succeeded... but Triple J stay silent on disqualification rumors. It's been over a week since #Tay4Hottest100 emerged and two days since voting in the Triple J's Hottest 100 closed. It looks like it worked.... "Shake It Off" is now favoured to enter the countdown according to one Melbourne computer nerd. Michael George, 34, armed with a computer science degree, told BuzzFeed News he manually entered 20,000 individual votes into a spreadsheet and ran the countdown in what he called the "Social Hottest 100". George said he scooped up the votes from people posting their votes on Facebook and Instagram, finding them using the hashtag "#hottest100". It was a process he had used in previous years in an effort to game the betting markets offering odds on the year-end poll. On Tuesday morning he posted the results with "Shake It Off" coming in number 75. He told BuzzFeed News, 1.5 million votes were cast last year and his sample size would mean the countdown will be quite similar on Australia Day. The poll was posted against the backdrop of fresh rumours Triple J has disqualified Taylor Swift from the countdown due to a KFC Facebook post about the hash-tag. A spokeswoman for Triple J told BuzzFeed News, "we have no comment at this time." Disqualification would be surprising because the KFC post does not include telling people to vote for Taylor Swift in the Hottest 100 in return for money. Australian artists also took time to weigh-in with Sydney duo Flight Facilities posting a long response last night. The Preatures' lead singer Isabelle Manfredi responded to questions about whether Swift should be included in the countdown. Shake it off is one of my favourite songs of the year. And former Triple J host Tim Ross told Manfredi, he would have spun "Shake It Off" if he was still in charge of the decks. @ThePreatures @MarkDiStef We used to play all the new Madonna and U2 songs on the J's. I would play Shake It Off. Then, like much of the tenor of the entire debate surrounding #Tay4Hottest100, NT News stepped into the void to stir up those who are against her inclusion. Final word can be given to Hottest 100 favourites Peking Duk who told Pedestrian it would be disappointing if trolls voted for Taylor Swift to mess with the countdown. But then Reuben Styles admitted that he's obsessed with Swift's hit "Out Of The Woods".